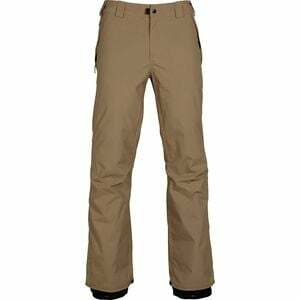 Looking for an inexpensive snow pant that won't leave you a sopping mess at the end of the day? Pick up the 686 Men's Authentic Standard Pant for shred-worthy performance that's priced right for boarders on a budget. Its InfiDry-5 shell keeps snow and slush from soaking through, and taped critical seams seal out moisture where it matters most. Mesh-lined Air-Flo thigh vents shed excess heat on warm spring days and heated park sessions. The Cordura-reinforced Horseshoe Hem keeps you from stepping on and inevitably fraying the backs of your pants, and boot gaiters prevent snow from getting in your boots when you're surfing through knee-deep powder. And when the snow really piles up, the PJ Connect system allows you to link your pant to your 686 jacket to create the ultimate anti-snow barrier. Even if you blew your budget on a season pass, you can still stay dry and stylish on the slopes with the Authentic Standard Pant.